Otahuhu Power Station's 404 MW combined cycle turbine. Also known as Otahuhu B. The Otahuhu power station site is located in Otara, Auckland, New Zealand, and holds two plants; Otahuhu A (open cycle gas turbines, now synchronous compensation) and Otahuhu B (a 404 MW combined cycle). It also is the site for the proposed Otahuhu C power station. The station is owned and operated by Contact Energy. 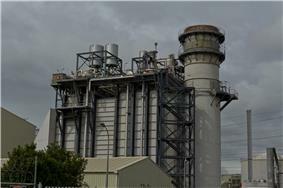 The first generating units at Otahuhu were open cycle gas turbine Stal-Laval units, commissioned in 1968. The plant comprised four 45 MW gas turbine units. In 1978, a further two generating units were added, twin pack units using Rolls-Royce Olympus gas turbines. The Otahuhu A gas turbines were retired from electricity generation in the late 1990s, however they remained in continuous service providing reactive power to Transpower NZ, owner of the national grid. In November 2013 the generators were retired from service and are in the process of being decommissioned. The combined cycle plant was commissioned in January 2000. This natural gas fired plant comprises a Siemens V94.3A(2) gas turbine in single shaft configuration. The HRSG is unfired triple pressure with reheat. Steam cycle cooling is by a hybrid wet - dry cooling tower, using sea water makeup. At commissioning, the plant capacity was 385 MW. In 2005, upgrades to plant components (including the gas turbine compressor) resulted in an increase of plant capacity to approximately 404 MW. The Otahuhu C power station is a proposal for a 400 MW combined cycle power station. Resource consents were granted by Auckland Regional Council for the plant in 2001, but construction has never commenced. In December 2002, Contact announced it was postponing the construction of the Otahuhu-C plant because of possible future insecurities of gas supply related to the expected depletion of the Maui gas field. In 2007, Contact said it would still be deferring a decision on the project as it was giving priority to renewable generation. CEO David Baldwin indicated that new generation growth would come primarily from new geothermal capacity. Also the Otahuhu C proposal should wait for the Government's intentions to adopt a market-based carbon pricing system to become clear. Baldwin still considered the Otahuhu C proposal was the most efficient gas-fired proposal in New Zealand and that it could help reduce emissions if it replaced less efficient coal generation. ^ a b "Energy in New Zealand 2013". ^ a b "Thermal electricity brochure - Otahuhu B CCGT". Contact Energy. 2007. pp. 5/6. Retrieved 23 November 2009. ^ Ritchie, Neil (13 December 2002). "Contact urge rapid gas development". Energy News Bulletin. Retrieved 30 August 2012. 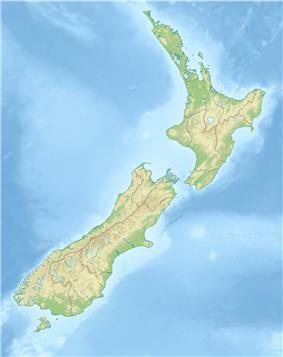 ^ "Contact unveils Waikato wind farm" (Press release). Contact Energy. 16 October 2007. Retrieved 30 August 2012. Mr Baldwin said Contact is continuing to defer investment decisions on its consented 400 MW Otahuhu C gas-fired power station in order to focus on renewable generation. ^ "Contact outlines $2 billion renewable generation" (Press release). Contact Energy. 23 February 2007.